Watermelon Seed Salad isn’t what you think! Refreshingly light and cool, Watermelon Seed Salad doesn’t actually include watermelon seeds, but toasted pumpkin seeds also known as pepitas. This dish has wonderful flavor and texture with a creamy goat cheese, crunchy pepitas, a sweet and tangy sauce with a hint of fresh basil. The beauty of this salad is that it can be served as a salad or dessert. Quick and easy to make, this is a crowd-pleaser, especially when it’s hot outside! 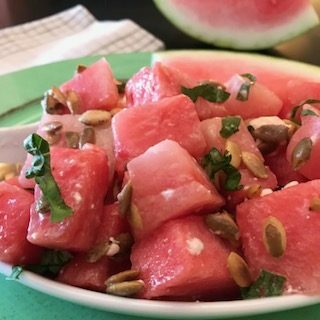 Combine the chopped watermelon with the white raspberry balsamic vinegar, toasted pepitas, crumbled goat cheese and allow to chill for about 15-20 minutes. Garnish with fresh basil and enjoy! Yes. 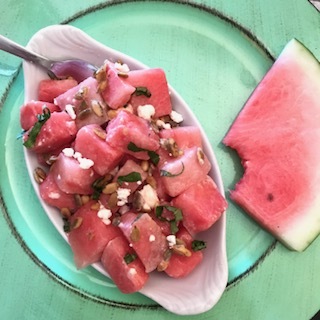 Traditional watermelon salads often feature feta cheese, but blue cheese or smoked Gouda would work equally well as a substitution for goat cheese. Do I Have to use White Raspberry Balsamic Vinegar? No, but it pairs really well with the other ingredients. White Raspberry Balsamic Vinegar can be purchased through the Grapevine Olive Oil Company. There are other flavored white balsamic vinegars that pair well with watermelon including Strawberry and Peach flavors. The important thing is to use a white balsamic vinegar; the dark vinegars discolor the fruit and cheese. What Can I Use Instead of Basil? Other herbs that pair well with watermelon are mint, parsley or cilantro. If you like fruit based dishes, take a look at Wine Poached Pears.